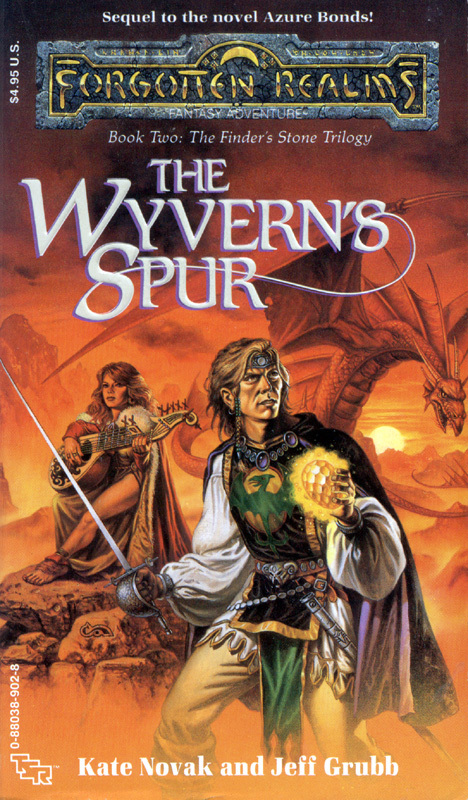 The Wyvern’s Spur – Let's Read TSR! I’ve been looking forward to reviewing this one for a while now. In some ways, it’s easily dismissed as an unoriginal work which is highly derivative of another, better-known author. Stop me if you’ve heard this one before: A foppish, foolish aristocrat with more money than sense lives with his uncannily competent valet. Everyone considers him a useless wastrel, and he lives in fear of his domineering aunt. He gets into and out of a variety of domestic and social scrapes in an amusing fashion. Sound familiar? It should if you’ve ever read any of the “Jeeves & Wooster” stories of famed British humourist P.G. Wodehouse, because it’s basically Bertie Wooster transplanted into the Forgotten Realms. 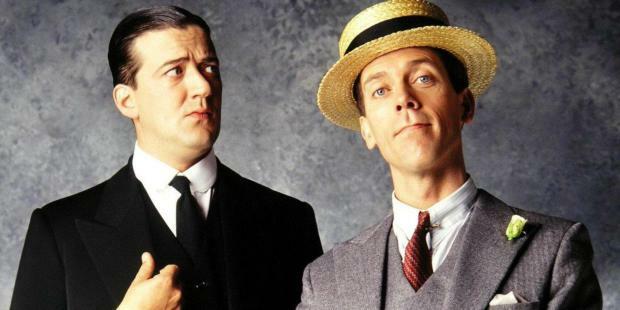 Stephen Fry and Hugh Laurie as Jeeves & Wooster in the excellent BBC series. But from another perspective, this very unoriginality makes it original: this may be the first of the Forgotten Realms books we’ve looked at so far which veers away from the standard “heroic fantasy” template. As a pastiche of the works of Wodehouse, it straddles the line between traditional heroic fantasy and the “fantasy of manners“, a genre which emphasizes the social aspects of the fantasy world over the action and questing and all that. There’s some magic and swordplay here, sure, but there’s also a lot of time spent on the Wyvernspurs’ family politics and intrigues. It’s about one-third comedy of manners, one-third mystery novel, and one-third swashbuckling action, which adds up to a much greater focus on the characters and their society than any of the other Realms novels to date. The rest, as befits their D&D roots, have all been focused on combat, travel, and exploration; The Wyvern’s Spur is the first one that feels less like “D&D fiction” and more like a story that just happens to be set in the Forgotten Realms. He shuddered again and wished that he’d stayed in Westgate, where all he’d had to worry about were dragons, earthquakes, and power struggles. They really were insignificant compared to these family crises. In the sleepy Cormyrean town of Immersea, the local noble family, the Wyvernspurs, are reeling from the brazen theft of an ancient family heirloom. Worse yet, one of their own might be the culprit. Giogioni Wyvernspur, the foppish black sheep of the family, stumbles home from his adventures in the previous book to find himself embroiled in the family emergency, which takes a more serious turn when one of his relatives turns up magically murdered. In the process of discovering what happened he uncovers family secrets, fights hordes of undead and a mad wizard, and drinks lots of tea. Meanwhile, the halfling bard Olive Ruskettle finds herself in Immersea and gets swept up into the plot when a friend of hers is killed. Thanks to her adventures with Alias, she’s much more aware of what’s going on than the Wyvernspurs — but she spends much of the novel unable to talk, reduced to gathering information in a four-footed form while thinking cynical, snarky thoughts. It’s nice to see Olive getting entire chapters to herself; her viewpoint scenes were some of the liveliest parts of Azure Bonds, refreshingly devoid of pretentious fantasy tropes. While she’s a bit more mature and less sociopathic than she was in the previous novel, she’s still no less fun to watch. The comedy aspects are genuinely funny, but then I’m a sucker for that sort of dry British-style humour. The mystery aspects are no Agatha Christie material, but still sufficiently twisty to keep things interesting. The action bits are generally pretty good, especially since Giogi is an inexperienced low-level fighter who’s more at home in a drawing room than a dungeon, and is in mortal danger from even a handful of zombies. Fight scenes here don’t have the sort of boring inevitability that they do in R.A. Salvatore‘s novels, where the characters are all unstoppable juggernauts of messy death. And it all ties in nicely with the plot of Azure Bonds, with a few of Alias’ “relatives” showing up to complicate matters, but stands on its own as an independent story even if you don’t read either of the other books in the Finder’s Stone trilogy. There’s one plot point that rests too much on coincidence for my liking — that Flattery and Cat should have randomly happened to meet and team up — but I’m willing to give it a pass because they have a good dynamic together. Giogioni is a consistently engaging and fun character to spend a novel with. They’ve beefed him up from his goofy one-note appearances in Azure Bonds, retaining the British upper-class mannerisms and some of the silliness, but giving him a deeper characterization as a compassionate, thoughtful young man with a family legacy to live up to. The end result is a lovable loser who’s torn, like Tolkien’s hobbits, between the familiar comforts of home and the lure of adventure in the wider world. His family still thinks he’s the same foolish, accident-prone dandy he’s always been, but they can’t see that he’s growing out of that role into something more mature and capable. Even he’s only partially aware of how much his recent travels have changed him. Much of the character development for both him and his family revolves around that gradually dawning realization. Olive is the only one of the main characters from Azure Bonds who returns here. She’s wiser and kinder now after her character development arc in that book, but still a trickster and an unrepentant thief. It’s fun to watch her struggle with her sudden respectability; she’s got everyone fooled into thinking she’s a famous bard and a Harper, but has only a vague idea of how such a person would actually act. As befits her role of “the sneaky one”, she does most of the sleuthing which explains the plot to the reader — though she doesn’t tell much of what she knows to the other characters. Cat makes a good foil to Alias from Azure Bonds. They’re both strong-willed, practical, and stubborn, but that’s where the similarities end. Cat is duplicitous instead of forthright, charismatic instead of blunt-spoken, and willing to submit to years of emotional abuse instead of being fiercely independent. It’s nice to see a novel that actually addresses serious issues like abusive relationships in a reasonably nuanced way. She knows that Flattery is evil and is terrified of him, but she still feels she needs him and desperately wants his approval. Abusive relationships in fiction are all too often resolved with “Well, why don’t you leave him, then?” “…Okay!”, and then it’s over. It’s never that simple in real life. Flattery makes an acceptable villain. He’s your basic power-mad evil wizard stereotype, but he’s got a good backstory which both explains his motivations and ties him into the plot of the previous book. Also, his brand of impulsive, uncontrollable rage is more genuine and frightening than the kind of moustache-twirling vaudeville villainy we saw in books like Black Wizards. As such, I’m prepared to cut him a bit more slack than I would your average power-mad evil wizard. The supporting cast is quite good. Thomas the butler and Dorath the domineering old aunt are clearly borrowed from Wodehouse, but have been changed enough in the process that it feels more like a case of inspiration than plagiarism. The entire Wyvernspur clan makes an appearance, and they’re all given distinctive mannerisms, personalities, and motivations. This is great for two reasons: it means that the reader doesn’t lose track of who’s who in the family, and it often puts them at odds with one another, driving the plot forward with juicy internecine intrigue. But it’s not just the protagonist’s family who get that treatment; even the most minor of characters, like the barkeep in a briefly-visited tavern or Giogi’s upper-class twit friends, get the sort of distinct personalities and details that make them memorable. Like its predecessor, personal identity is the core theme of The Wyvern’s Spur. Giogioni wants to deny his destiny and cling to his “useless fop” identity, but by the end is forced to accept who he is and finds his self-confidence in the process. Cat has no idea who she is or where she came from. Without getting into spoilers, Flattery’s complicated relationship with his parent involves a serious identity crisis. And Olive loses her identity in a very literal manner, spending half of the novel polymorphed into a domestic animal and being unable to communicate. By the end, everyone’s worked out their problems and learned something about themselves in the process. There are some issues. The overall quality is quite high, which makes the occasional awkward bits stand out more dramatically. “I agreed to help you sneak the spur from the crypt,” Julia said, desperately trying to convince her brother of her loyalty. That’s a pretty cardinal sin for writers there: having the narration tell us internal details about non-viewpoint characters. Remember, “show, don’t tell.” You shouldn’t have to tell us that she’s desperately trying to convince her brother; if you do a good job of showing her pleading, the reader will figure out her intentions and mental state on their own. Sentences like this crop up infrequently, but stand out enough that I couldn’t help but notice. Nothing a thorough editing pass couldn’t have fixed. Like the previous book, the pacing in The Wyvern’s Spur is quite good. Action sequences are interspersed with social scenes, and exposition is something which the characters have to earn by successfully navigating scenes of suspense or danger. The natural ebb and flow of the story keeps your interest sharp and makes you want to keep reading. What really sells me on this book, though, is the quality of the details. Characters mention famous artists, half-remember snatches of nursery rhymes, play complicated card games , have quaint local traditions — things which don’t mean much individually, but when taken together add up to the impression of a vibrant culture surrounding them. The town of Immersea is described rather vividly, with attention paid to the details of its bustling daily life and how its streets look and feel in all sorts of weather. Fifteen generations of Giogioni’s family tree are recorded in an inset at the front of the book, and quite a few of the names on it are either mentioned in conversation or directly relevant to the plot. Novak and Grubb have done a good job of making the world feel like a living place, rather than just a stage where the characters play their parts. Honestly, I wish more of these novels would dare to venture further afield from the standard “go on quest, fight monsters” tropes of the heroic fantasy genre. While I think that Azure Bonds was a slightly better novel, I’m willing to boost The Wyvern’s Spur from an A- to an A just for its willingness to bend, if not quite break, the mold. And the two of them are head and shoulders above the rest of the books we’ve looked at thus far. If I recall correctly, it’s going to be rather a while until they have any serious competition at the top. I admit that I spent a fair amount of time as a kid trying to work out a set of rules for Elemental Empires, the card game Giogi and his friends play at the inn, based on what few incidental details of the rules I could glean from the scene. Edit: Looks like Elfshadow also used this approach, so it’s not quite as “never again” as I remembered. I stand corrected!